2-component coating repairs with ships, pipelines and steel constructions are usually done by hand. This leads to high labor costs and a huge amount of waste material. MixCoat™ Spray offers a solution, being faster, cleaner and more economical. The portable MixCoat™ Spray system is ideal for 2-component coating repairs and maintenance jobs. This stand-alone system only requires an air connection. A dual-stage-trigger for the integrated air flow control allows the user to operate this system with only one hand, which makes MixCoat a unique, user friendly solution. 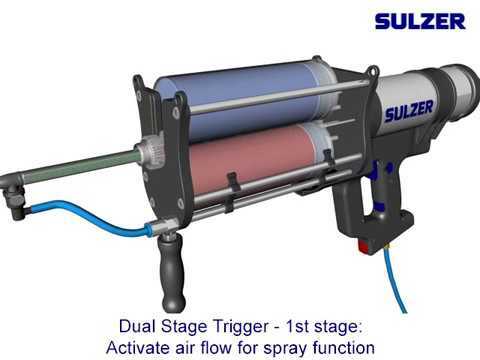 Animation on the functionality of the Sulzer MixCoat Spray system for 2-K protective coating repair jobs.